Purchased from the artist by Mason, June 1900 (£40). M. Newman Ltd., London, 1974. Anonymous sale; Sotheby's, London, 28 September 1988, lot 60. The artist's own sale records, 1900. 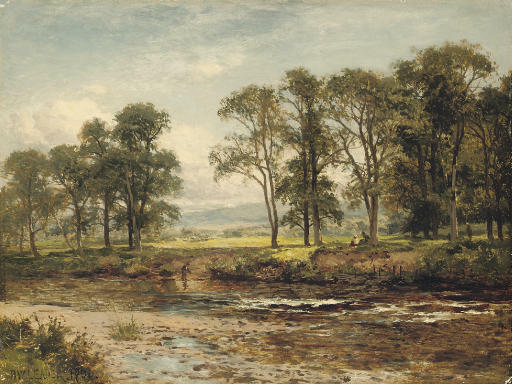 The landscape of northern Wales was a source of inspiration for Leader throughout his long career. In contrast with lot 97, which depicts the River Llugwy in spate, this small oil study on board is at the junction where the Llugwy flows into the Conway just north of Betws-y-coed on its way to the Irish Sea at Conway Bay. We are grateful to Ruth Wood for her help in preparing this catalogue entry. Mrs Wood is working on a catalogue raisonné of the artist's paintings.